Tuesday nights are easily my favorite night of the week. We get to come together and worship Jesus, learn from His Word, and spend time with one another. I love the passion and excitement that students have for coming together. I love the feeling in the atmosphere when our worship leaders lead out spontaneously. I love preaching the word and watching it resonate with you. I love meeting new students who have come for the very first time. Tuesdays are amazing. We have another Tuesday Night Gathering tonight and it got me thinking, "If I had to give ten reasons as to why we meet weekly, what would I say?" Why is it so important that we meet together every week? Hebrews 10 touches on the importance of meeting together. Hebrews 10:24-25 ESV - 24 And let us consider how to stir up one another to love and good works, 25 not neglecting to meet together, as is the habit of some, but encouraging one another, and all the more as you see the Day drawing near. Stirring each other up for love and good works and encouraging one another are two reasons that the writer to the Hebrews gives for why we should meet together. I came up with a list of my own in no particular order and thought I'd share them with you. One reason we meet together is to exalt Jesus and worship Him. In the midst of a campus of people who do not know Jesus yet, we lift up His name, declaring that He is God. We worship, not to remind God of who He is, but to remind ourselves of who He is and that He is worthy to be praised. Along with worship, we celebrate. We celebrate that God is the God of victory. We celebrate that Jesus defeated death, sin, hell, and the grave through His resurrection. We celebrate that God loves us each individually and uniquely. We celebrate that Jesus pursued us when we were not worthy to be pursued. We celebrate that God is in the business of redeeming all things. In today's church, we often miss the importance of corporate prayer. We miss the importance of praying together as a body. On Tuesdays, we give 20 minutes for corporate prayer before service from 7:20-7:40. We also pray during key parts of the service. Prayer is so important. If we want to draw closer to Jesus and change our campus, we need to ask the Holy Spirit to do what only He can do. We believe that discipleship is why we exist. We exist to become disciples and make disciples. Discipleship is the process by which we become more like Jesus. One way that we grow in discipleship is biblical teaching. We need to be continually reminded of the gospel and built up in the Scriptures so that we can grow in Christian maturity. If we want to become mature disciples of Jesus, then we need weekly biblical teaching that is full of grace and truth. We love reading God's Word and seeing how it applies to our lives on Tuesday nights. Another reason we come together is to encourage one another. Life can be hard. College life can be hard. We need to be encouraged. "The homework will get done." "This test will surely pass." "God is with you!" "This is only a season." We need these weekly reminders. Tuesday nights are an opportunity to encourage one another in the seats and also be encouraged from the platform by our worship leaders, pastors, and student leaders. We don't only need to be encouraged, but we also need to be challenged. It's easy to slide into complacency and a lack of passion for the Lord. We need to be pushed to grow into the person that God has called us to be. We need to be convicted of our sin and challenged to pursue Jesus. We pray that every week you will walk out of Tuesday nights with a specific challenge from God. Tuesdays are also a strategic opportunity to introduce your friends to Jesus. Every week, we share the gospel and give opportunity for students to put their faith in Jesus. Tuesdays are not just a time for us to enjoy one another and grow personally, but also a time to reach out to our friends and grow God's Kingdom. As much as Tuesday nights are about mission, they are also about community. They are an opportunity for us to get to know one another more. For us to go deeper together and share life with each other. We share our victories and our struggles and also just have a good time with one another. Every week, we cap off our Tuesday Night Gatherings with a party at Buffalo Wild Wings for this sole purpose. Tuesdays are also a great opportunity to make friends. I met some of my best friends in the world (including my wife) at a Chi Alpha service. Our prayer is that every student who is a part of Chi Alpha would know that they have friends here. Finally, Tuesdays are an opportunity to serve. Whether that be on the worship team, connect team, production team, or just creating a friendly environment for guests, Tuesdays are an amazing opportunity to use your gifts for God, others, and His Kingdom. These are a few of the reasons why I come every Tuesday and believe in the power of a Tuesday night. What are your reasons? Tonight, we are moving into Lang Auditorium. This has been quite the journey of prayer, strategizing, and trusting in Jesus. What I hope to do in this post is give you insight into this journey and encourage you with three thoughts as we move into our new home. Last spring, we realized that the Communication Arts Center would not be able to facilitate our gatherings for much longer. With 87 seats and an average attendance of 60 students during that semester, we knew we had to get a game plan for the future if we wanted to grow. We then went on an exploration of every classroom on campus to see where we could move next. With the remodeling of Schindler, there was really no logical next room for our group. 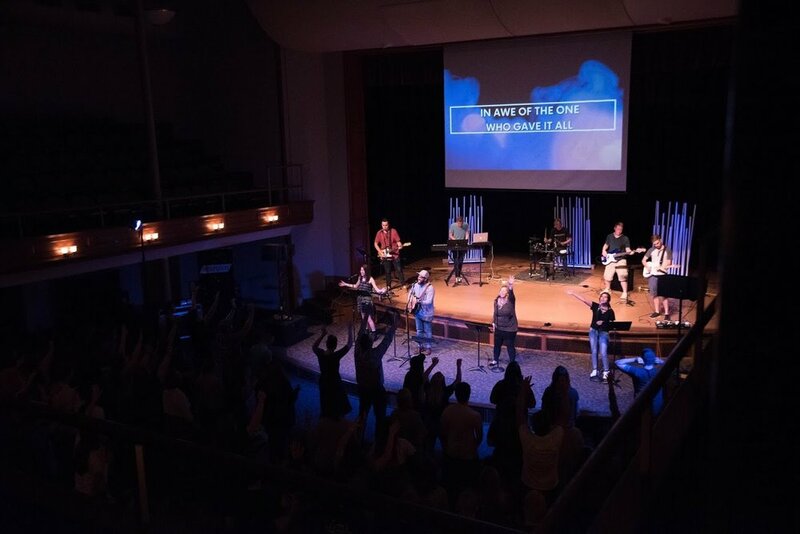 A logical room would be a room with 200 or 300 seats, but there really isn't a room like that on campus, especially one that is fit for a worship service. One afternoon as Lovensky and I were checking out rooms, we decided to look at the monstrous room of Lang Auditorium just for fun. We got one of the employees in Lang Hall to open the room for us and we checked it out for the first time. Lovensky's eyes widened as he looked around the room and dreamed of what could be. My response was a bit different - yes, excitement, but also scattered thoughts and questions. At this point, we were having 60 students at our services. As I looked around at the 800 seats, an internal struggle began. One part of me thought, "It makes no sense to move to a room that is over 10 times bigger than our attendance." The other part of me thought, "Where else can we go? The CAC is too small. We are dreaming for more. Why not take a step of faith and believe God to fill the seats?" Over the following weeks, we prayed as a team for guidance from Jesus and sought wise counsel from other pastors. God squeezed our hearts and challenged us to step out in faith. We unanimously felt that the Lord was giving us the green light to move into Lang. We then went to reserve the room for this fall, but realized that many people had already reserved it on Tuesday nights and that we couldn't get it consistently until November 1st. I felt that the Lord wanted us to move on this date for a reason. We decided to go for it and planned for a November 1st move date. This all happened before April. So for the last 7-8 months we have been preparing for this move. Since then, we have went over maximum capacity twice in the CAC. Now, here we are on move day looking into the future with expectant hearts and nervous anticipation. As we move, I want to encourage you with three things. It's tempting after a move like this to let your hunger for more wane. Just two years ago, we were a small ministry with about 20 people plugged in. There is so much to celebrate and thank God for as we have grown by almost 500%. However, we cannot take our foot off the gas. We have to keep pressing into the Lord, serving with passion, praying hard, and casting the net for new students to plug in. It's also tempting to expect God to fill the room right away. This is certainly possible and I believe the Lord may do a quick work. However, we didn't sign up for quick growth or for an easy task. We signed up for faithful ministry over the long haul. We signed up for the daily grind of loving students, maturing in the Lord together, and preparing the way for a long-term sustainable work of God on the campus. Let's think long and refuse to be discouraged by the daily struggles. We are working for something so much bigger than this year or even this week. We are working to provide UNI students for generations to come with an opportunity to respond to the gospel and mature in their faith through the community of Chi Alpha. Finally, keep on dreaming big. Dream and pray for revival each and every week. Dream that God could wake up hearts all over our campus in a moment. Dream that God could fill up Lang Auditorium on Tuesday nights. Even dream that we would have to have two services in Lang on Tuesday nights to facilitate all of the students. God is capable of far more than our wildest dreams. Tonight is the beginning of a new chapter in the life of Chi Alpha at the University of Northern Iowa. I pray that Lang Auditorium could be our home for many years. I'm eager to get started on the long mission ahead tonight. Keep being FAITHFUL, think LONG, and dream BIG. Note: I got the principles of thinking long and dreaming big from The Circle Maker by Mark Batterson. In his book, he challenges us to DREAM BIG, PRAY HARD, and THINK LONG. I encourage you to grab a copy. I don't know about you, but I struggle with getting the motivation to pray. I think it boils down to two reasons for me. One, I like to do things that give me immediate results. Sometimes, we don't see an answer to our prayer for years or we don't feel God's presence when we pray. This can be discouraging. The other main reason that I struggle with getting motivated to pray is I can't seem to focus. Five minutes in (more like five seconds) and I'm already thinking about all of the things that I need to do that day. Despite the difficulty of praying, I know that I need to press on and do it anyways. I know that if I want to be intimate with Jesus and grow in my faith then I have to pray. And the beautiful thing is, I never regret it when I do pray. God is pushing me to pray more. The last couple nights, Emily and I have taken time to prayer walk the campus in preparation for this coming fall. Our goal is to do this every night until our fall kickoff service on August 23rd. I want to invite you to pray this summer and ask God to move in your heart and on our campus this fall. We believe that it's important to do this for two main reasons. In Mark 9, Jesus's disciples attempt to cast a demon out of a boy but are unable to do so. Then, Jesus comes in and casts it out in a moment. The disciples later pull Jesus aside and ask Him why they were unable to cast it out. Jesus tells them that their lack of prayer prohibited them from driving out the demon. Jesus says that this kind of breakthrough is only possible through prayer. If we want to see UNI changed and heaven unleashed on earth, we need to pray. We need to pray for the situations and hardships that will come our way. We need to ask God to empower us to bring hope and healing to our friends. Prayer is the key to driving back the darkness and our greatest weapon in defeating the enemy. The second reason we need to pray is prayer changes our hearts. Although we don't always see external results, prayer will always do a work in our own hearts. Every minute that we spend praying is time spent with Jesus. No moment in prayer is wasted time. I'm excited to see what God might do in our hearts as we pray for our campus over the next month. What dark spaces of my heart will God invade? What sins might God reveal to me? What healing will God bring? What dreams will He download into my heart? What new passions will He give me? We need to pray. Specifically, we need to pray for the fall so that our hearts will be ready. We need to be with Jesus. We need to give God room to work on us before we ever hope to bring hope and healing to our campus. I urge you brothers and sisters, pray and, specifically, pray with us for this fall! Get with Jesus. What could God do with a group of people who have spent extravagant time with Him? What could He do with a group of people who are committed to changing the atmosphere of their community? How might God use us to change our campus and bring hope to our friends? Let's give God time during the remaining days of summer. Let's push back the darkness with our prayers.